Named after Martin Miller’s original base in Westbourne Grove, West London, Martin Miller’s Westbourne Strength Gin is made in exactly the same way as Martin Miller’s Gin. Same botanicals, same spirit, same pot still methods. The major difference is that it is bottled at the much higher 45.2% abv. At this strength the taste profile veers towards the more classic London Dry style with lots of delicious juniper, spice and citrus flavours. Its more traditional character means that Westbourne Strength is perfect in classic cocktails like the Negroni where a more obvious juniper hit is required. The quality of Martin Miller’s Westbourne Strength Gin has been recognised by numerous awards in prestigious spirit competitions around the world. 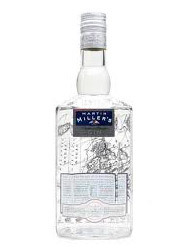 Martin Miller’s Westbourne Strength Gin is produced by the Reformed Spirits Company, Plaza 535 King’s Rd. London SW10 0SZ, United Kingdom, Tel: 0207 352 8697.